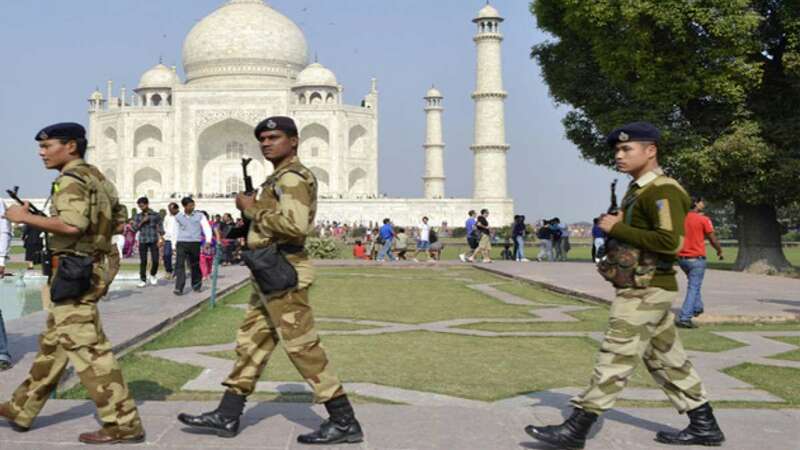 New Delhi : Security has been tightened at the 17th century monument Taj Mahal in Agra along with many other important places, tourist places and government offices across the Uttar Pradesh after Intelligence Bureau (IB) issued an alert of a potential threat by terrorists. According to the officials, additional security has been deployed at the Taj Mahal in the wake of the terror threat. Around 36 extra commandos have been deployed at the Taj, who will keep an eye on each and every activity at the four entry points of the monument. # Central Industrial Security Force (CISF) personnel have been alerted on the possibility of a terror attack. # Security has also been beefed up in cities like Lucknow, Agra, Kanpur, Moradabad, Bareilly, Meerut, Muzaffarnagar, Varanasi and Allahabad, in wake of the ongoing festive season. # The officials at the Taj Mahal have been asked to alert the police and the CISF immediately if they sense anything suspicious.